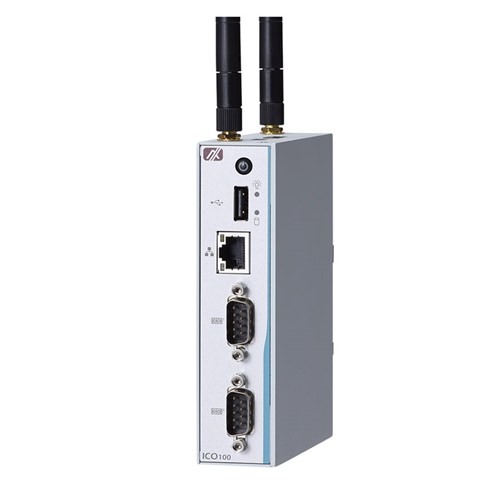 ICO100 is a robust din-rail industrial fanless embedded field controller which supports low power Apollo Lake Intel Atom x5-E3930 dual core processor. It supports maximum 8GB DDR3L SO-DIMM memory, two RS-232/422/485 ports, two USB2.0 ports, one Gigabit Ethernet LAN port, one 8-bit digital I/O port for IoT gateway applications. It also supports two PCIe Mini Card slots, one SIM card and two internal antennas which are available for 3G/GPRS and Wi-Fi connection. The reliable and robust ICO100 is a prefect solution for industrial IoT applications such as smart energy, smart automation, facility monitoring systems and many more.